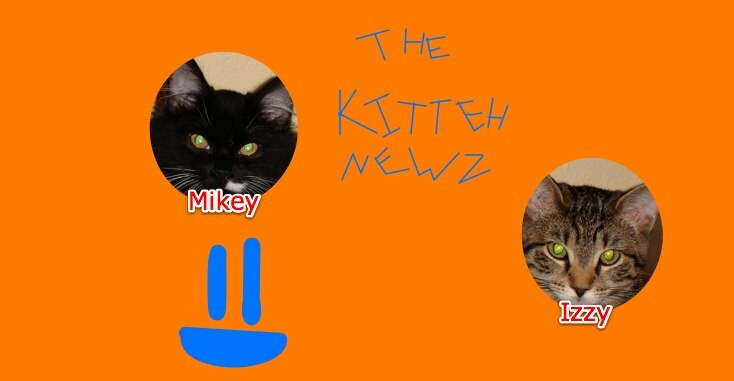 The Kitteh Newz: Birfdai Kake! It r be owr birfdai. We shur Meowma awlreddy pozt'd baowt dat, huh? Enywaiz, we iz sew hapi wif owr fudz! IT WUZ TEH BIRFDAI KAKEZ!!!!!!!!!!!!!!!!!!!!!!!!!!!!!!!! Et leezt, dat iz whut Meowma sayed. It hadded a kandel in itz, sew dat meens it r birfdai kake, rites? Whuteva. We nommed it down likez we wuz wulfz. Meowma and Grameow go 'heeheeheehee!' We no kno y. Happy Birthday, Mikey and Izzy!!!! The Kitteh Tower Is Here!